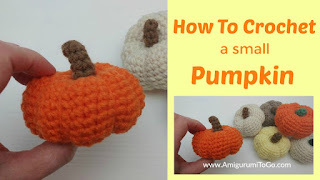 I have a beginner friendly video for crocheting a small pumpkin. It is for the absolute beginner. It will show you how to crochet a magic ring, how to crochet the pumpkin, how to add the lines, how to crochet the stem and sew it in place. During this video I show you how to read the rows of the written pattern. If you have never crocheted before or are still learning, this video is for you! Or happy, it's up to you. Once you make the pumpkin you can add a face. I have a video for that too.